Tom Barbash may have made a convert out of me with Stay Up With Me, his new short story collection. I usually hate short story anthologies, but this one was moving, compelling, and interesting. This is not a collection of stories with fast moving “shoot ‘em up” plots. It is more a group of stories exploring the ways that people are interconnected with one another, how they relate, and how these interactions change each individual. I had a few favorites among the thirteen stories. “Somebody’s Son” was my absolute favorite. Randall and his partner are trying to swindle an elderly couple out of their acres in the Adirondacks. Along the way, however, Randall makes a connection that changes his plans. I also loved the first story in the collection, “The Break”. A young man is visiting his mother, who has clear expectations for his future. When the college student begins dating a waitress he meets on a trip to a restaurant, his relationship with his mother becomes even more intense and complicated. There was not a bad story in the book. Honestly, I enjoyed each one. They are quiet masterpieces filled with real people in real situations, exploring their environments and their relationships with each other. If you are looking for action packed stories, look elsewhere. 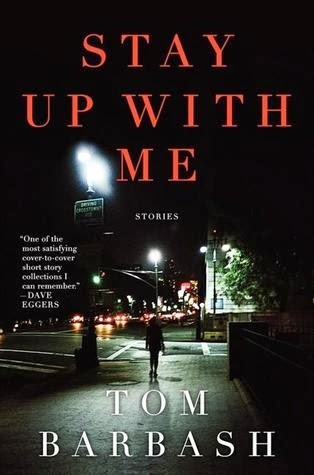 However, if you are looking for stories exploring humanity and choices, Stay Up With Me is the short story collection for you.